Skip Bin Hire Melbourne: Is A Large Dumpster More Cost Effective Than Skip Bin? Skip bin hire Melbourne: when arranging waste management and recycling services (such as Melbourne rubbish removal) for your business, a general rule of thumb is that regular, scheduled collections of industrial rubbish bins are significantly cheaper than one off skip bin services. When we speak to customers – who may be new in business or are seeking to expand their operations – there is often confusion over what kind of bin they require – i.e. whether they need skip bin hire Melbourne services or a regular dumpster hire or larger bin. We will seek to answer this question and more in today’s blog on skip bin hire Melbourne. Skip bin hire Melbourne: with a skip bin – a large bin (up to c.30 cubic metres) is delivered and left on site for a set period of time. The bin is generally delivered and picked up by a dedicated truck. Pricing is split between delivery / transport components and then disposal per tonne basis (for indicative pricing on disposal per tonne rates – see Knox City Council doc here showing disposal rate of $200 per tonne). This service is usually more suitable for one off or very infrequent services. Note: for further details on all things Melbourne bin related – check out our articles on waste management Melbourne and waste collection Melbourne. When should you book skip bin hire Melbourne services? – You have construction or building waste such as bricks, timber, pavers etc. This could be from a building or renovation project at a commercial or residential address. In this instance – you will require a skip bin service as the contents are not suitable for collection in a regular garbage truck. – If you have hazardous materials such as asbestos. Asbestos can not be collected in a regular garbage truck as it will contaminate the contents of the truck. – There are strict criteria for disposal of asbestos as regards skips which must be adhered to. – A skip bin service can be suitable for product destruction services – i.e. where items are taken away to be destroyed or for deep burial. – Skip bin hire can also be suitable for short term services – i.e. where a regular commercial bin collection would not be suitable. Mini skip bin hire Melbourne – i.e. all sizes of skip bins available from 2m upwards to c.30 cubic metres. When would a front lift bin or dumpster service be better for you than skip bin hire Melbourne? 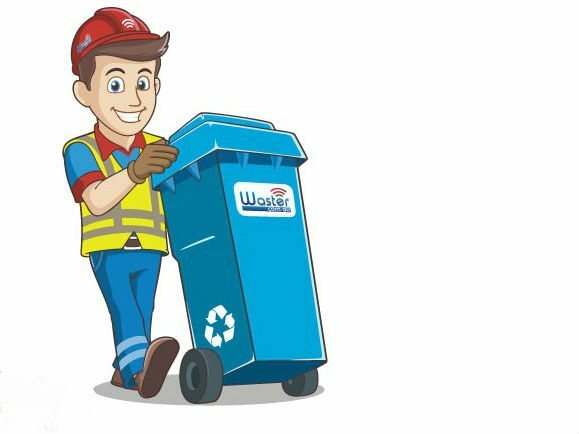 Front lift bin / dumpster service: Waster provides large dumpster style bins (known in the Australian waste management industry as front lift bins) in sizes from 1.5 cubic metres to 4.5 cubic metres. A large front lift bin service or dumpster service is more suitable and cost effective for regular ongoing services such as at a shop, office or regular business that produces general waste i.e. non construction waste. By organising a large bin i.e. what Americans would call a dumpster – you can obtain much cheaper waste removal charges for all types of general waste and recycling streams (i.e. the images in the picture above are for large paper and cardboard recycling bins). With a Front Lift Bin / Dumpster service – the bin is not removed each time it is emptied – it is simply flipped into a garbage truck. This delivers considerable economies and reduces the cost of collection for business customers. You can check out a short video of how a front lift bin is emptied as below – where the bin is tipped over the top of the rubbish truck. You can easily book your required waste management and recycling services and bins online today by accessing our online waste shop – simply press the blue button below. If you have any questions or seek pricing for additional services – simply contact us at 1300 WASTER or see our contact page here. Hey!!! First of all great thanks for a posted awesome blog… Can u tell me about how to Book Online Skip in Sunshine Coast?